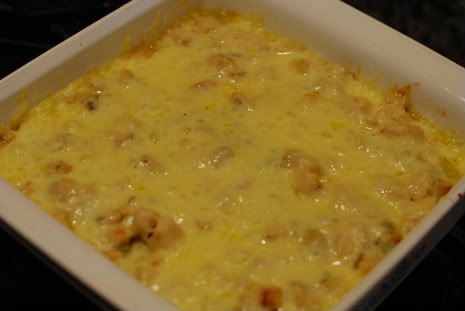 A cheesy family favorite, this dish uses convenience items to make dinner a snap to prepare! It's amazing how so few ingredients, can be combined to make kid and husband friendly gooey-goodness. 2. Spray bottom of an 8x8 square baking pan with oil. 3. 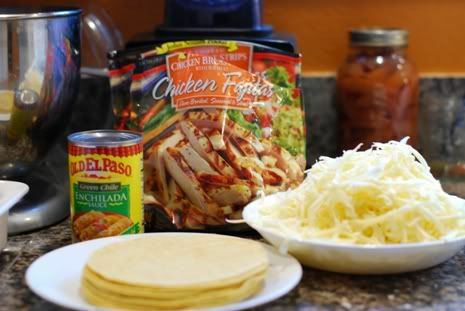 Layer corn tortillas, 8 oz diced chicken, 1/2 can green enchilada sauce, 8 oz shredded monterrey jack cheese. 4. Repeat layers. 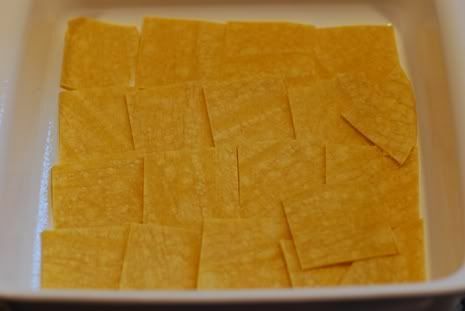 For variety, you can use pepperjack for one layer, although it is too dry of a cheese to use on both layers. 6. Serve immediately. Would be delicious served with black beans and corn salsa! 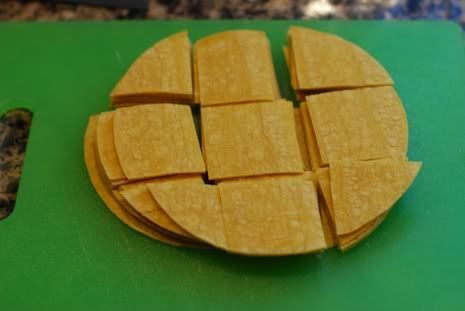 Cut the corn tortillas into squares. This makes it easier to dish out of the pan than a single round piece would be. 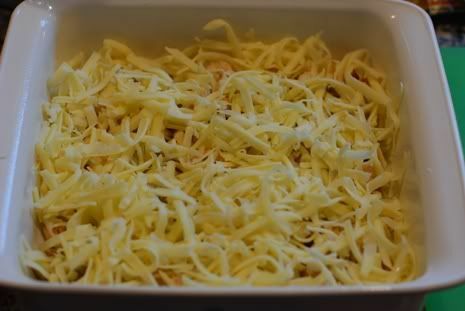 Place a single layer of the tortillas in the bottom of a greased baking dish. Look at how cozy the squares look. Since we don't want to discriminate, be sure not to waste the odd triangular-ish guys. Add ze chicken. I like to use John Soul's Fajita Chicken Breast Strips. Drizzle half the can of green chile enchilada sauce evenly over the top. *I use Old El Paso brand because it is a relatively mild green enchilada sauce. The Hispanic brands are generally spicier, so choose according to your heat preference. 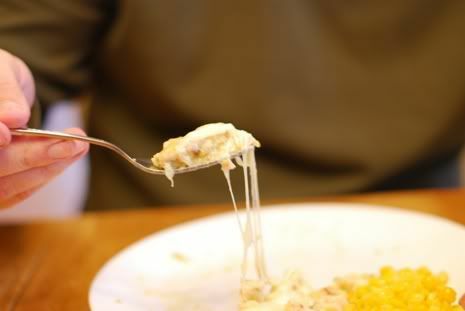 Now it's time to spread 1 cup of the shredded cheese. I like to use monterrey jack but you can do a Mexican blend or some pepper jack for a kick. 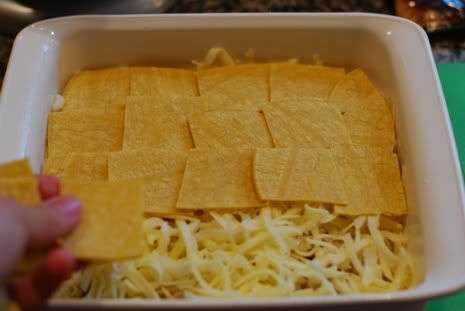 Repeat the layers of tortilla and the rest of the chicken, enchilada sauce and cheese. You can stop here, cover and put it in the fridge to bake later if you like. Just be sure to bring it to room temp or add extra minutes to the baking time. If you are hungry, just pop it uncovered into a 350 degree oven for 30 minutes or until bubbly and hot. Serve immediately. Ideally, you would serve it with something fresh and healthy like a salad. But since we aren't fresh or healthy at our house, we just eat it with corn. I KNOW. We are so very bad. I think extra jalapenos, corn salsa or even black beans would make a nice addition. 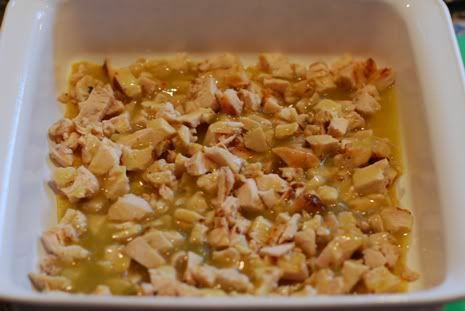 This is a rather gooey dish so if you can think of something crunchy to add, feel free! Enjoy this warm, ooey-gooey-goodness on a cold day. Or if it's summer when you finally get around to making this dish, just crank up the a/c and let me know if you like it or not. This is one of the few dishes that tastes just as good or better reheated than it does fresh out of the oven! This is one of our favorite dishes (thanks to you). We NEVER have leftovers. It is YUM-O! I'm so hungry right now. Argh! You can not beat the convenience of that! I've got to bookmark this. Oh, I'm going to have to try this recipe. 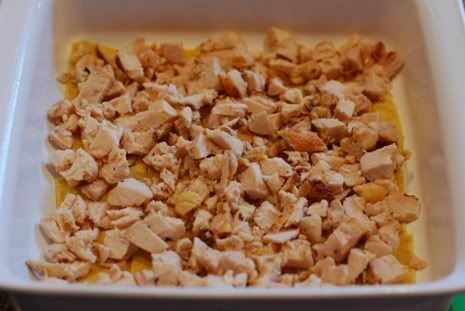 My guys would love the cheesy chicken goodness. We do the SAME thing, except for no chicken! We use Mild Chili Beans and Ground Turkey mixed with the Enchilada Sauce. Top, each scoop with Sour Cream! Delish! It's my daughters favorite! Will try chicken sometime. I love this recipe and I'm going to make it. Very soon. Maybe multiple pans!! I'll let you know how it tastes! I LURVE it when you post recipes, and I'm definitely going to try this one...looks so good. Ooooooooo.... It does look good. Will have to try that one day soon. And well, don't feel bad we don't eat fresh and healthy much around here either. Oooh..I'm glad I am going grocery shopping today. That is definitely going on my list! 8x8" pan?! I could eat that much myself! Yummo! This looks seriously so good. I wish my kids would eat chicken. I might make it anyway. YUM!! 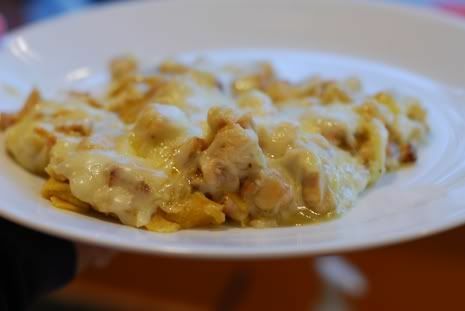 Its really similar to the enchiladas I make. I also add a can of cr. chicken soup to my chicken. Makes it extra creamy!